Bro. Adam Gross, P. M., Senior Deacon of Elvin E. Helms Lodge No. 926, and Bro. Dan Kemble, P.M., along with Bro. 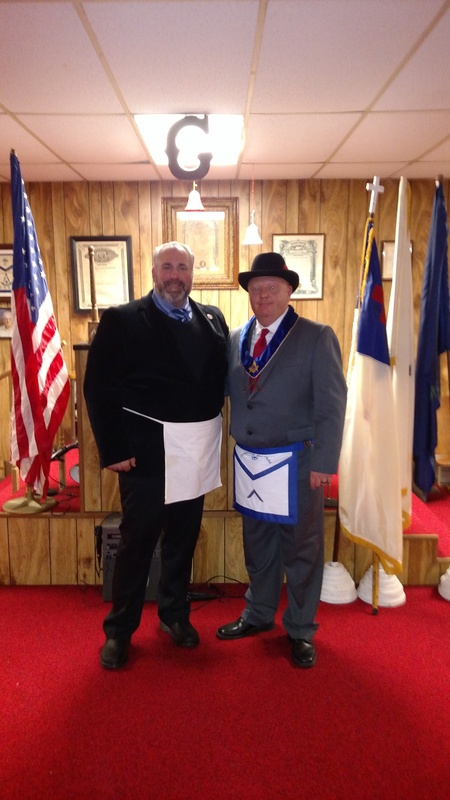 Dave Cassesa, P.M. and Honorary Member of Elvin E. Helms Lodge No. 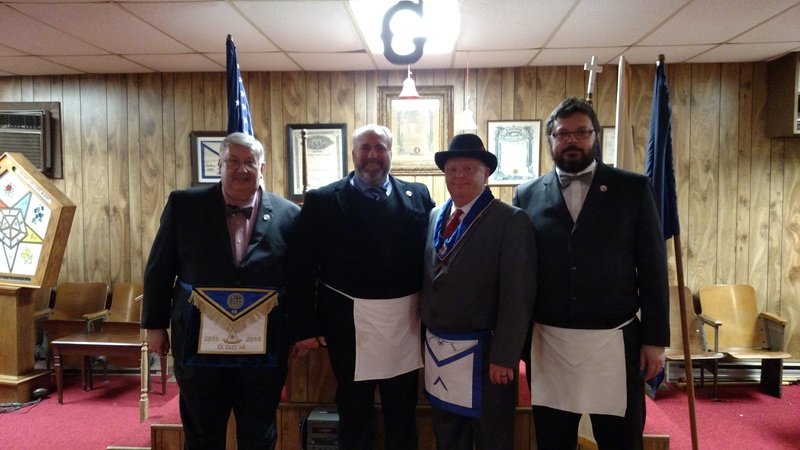 926, traveled to Lowmansville, Kentucky, on December 29 to witness the installation of Worshipful Bro. Eddie Hazelett as Master of Ted Adams Lodge of Research No. 998. Bro. 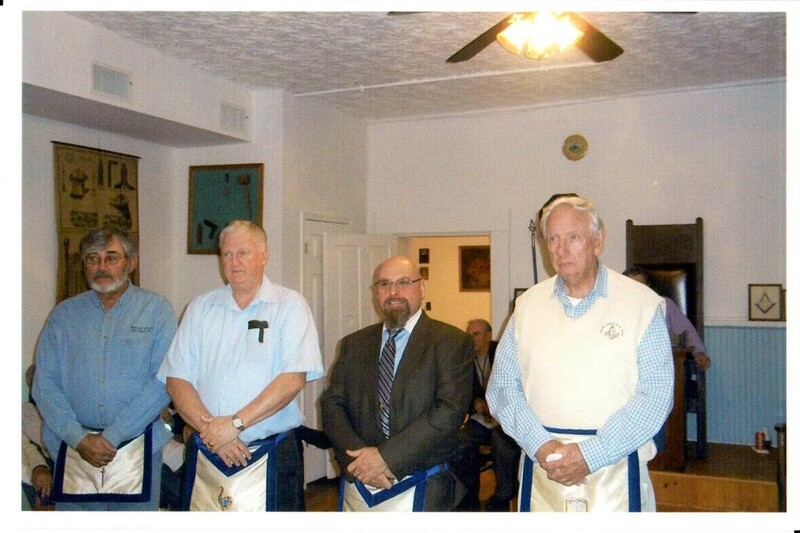 Hazelett is also a member of Paintsville Lodge No. 381 and serves that Lodge as its Master this year as well. Bro. Hazelett is a Scottish Rite Mason and a member of the Valley of Covington. 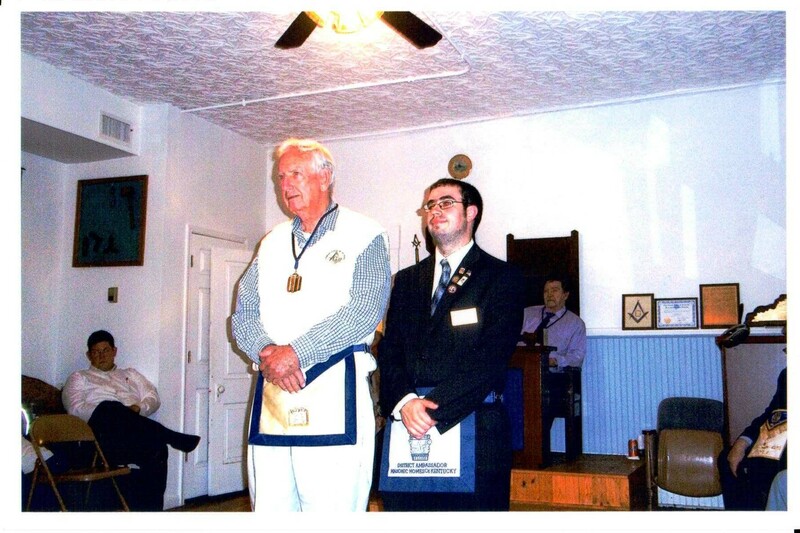 He is a frequent visitor to Northern Kentucky Freemasonry. Kentucky is in the fortunate, and quite rare, position of being home to two Lodges of Research. 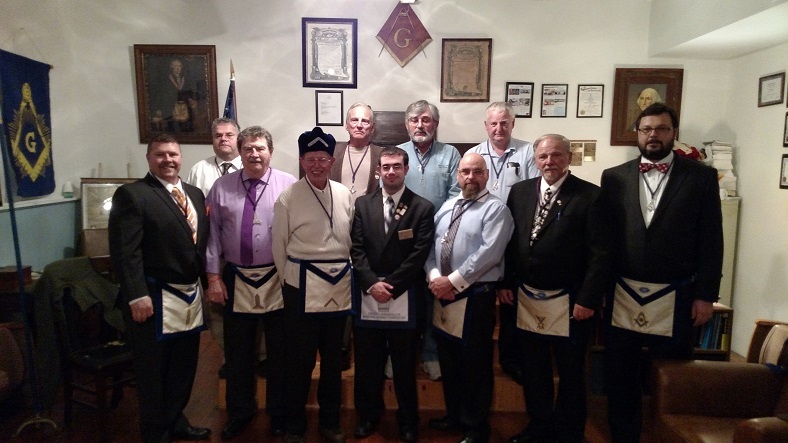 Ted Adams Lodge of Research meets on the 5th Tuesday, when occurring, at Chandlersville Lodge No. 858 in Lowmansville and our own William O. Ware Lodge of Research No. 999 meets on the 5th Wednesday, when occurring, at the Scottish Rite Temple in Covington. Worshipful Bro. Cassesa is serving as Master of William O. Ware Lodge of Research No. 999 this year. Both Lodges of Research are a tremendous resource for those with interest in Masonic education and research. Please support the Lodges of Research whenever possible. 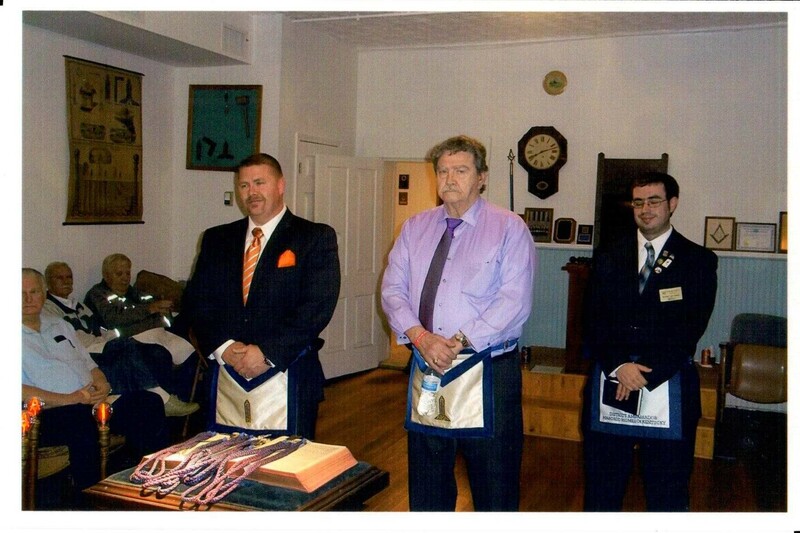 Pictured left to right: David Cassesa, Worshipful Master of William O. Ware Lodge of Research No. 999 and Eddie Hazelett, Worshipful Master of Ted Adams Lodge of Research No. 998. 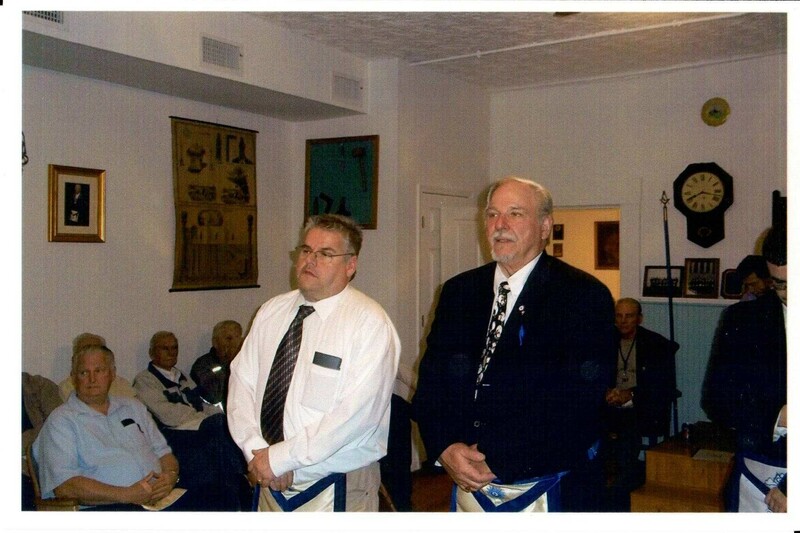 Pictured left to right: Dan Kemble, District Deputy Grand Master, District 18, Grand Lodge of Kentucky; David Cassesa, Master of William O. Ware Lodge of Research No. 999; Eddie Hazelett, Master of Ted Adams Lodge of Research No. 998; Adam Gross, Grand Lodge of Kentucky Committee on Masons Helping Masons. Our fund raising efforts to provide Christmas gifts for students at Kelly Elementary School were successful again this year. Our Lodge raised enough money to provide gifts for ten children who otherwise may have had very little for Christmas. We were able to provide each child with shoes, shirts, pants, other miscellaneous clothing and toys. Thanks to Bro. Allan Stephens for his assistance in procuring much of the clothing. Thanks also to Bro. Jason Wallace and Mary Beth Wallace for completing the shopping and delivering the gifts to the school. A special thanks to Shelly Hoxmeier, Family Resource Center Director, for her efforts in identifying the students in need and providing the shopping lists. Merry Christmas to all of our friends and Kelly Elementary School. All of the donors to our Kelly Elementary Fund had their names entered in a drawing for two $ 250 pre-paid Visa gift cards. This year’s winners were Bro. Buddy Wallace, our Senior Warden and the Master of Burlington Lodge No. 264, and Bro. John Schmidt, of Louisville Lodge No. 400. Congratulations to Bro. Buddy and Bro. John! With everything slowing down for the holidays we took the opportunity to relocate Elvin E. Helms No. 926 to wordpress.com. We hope you’ll find our site so familiar that you didn’t even notice the change. If anything we hope the site loads faster. All of our downloads have been relocated to Dropbox so those items should load much faster as well. From all of the Brothers of Elvin E. Helms No. 926, we wish you all a Merry Christmas and a Happy New Year! The Brothers of Elvin E. Helms No. 926 gathered for the annual installation of officers for the 2015-2016 year. Holly Kemble prepared a fantastic meal, as always, and the officers brought an array of desserts. There was more food than we could have hoped to eat but that didn’t stop us from trying. After the meal we proceeded to elect our new officers for the 2015-2016 Masonic Year. Pictured above, left to right: Jason Wallace, Junior Warden; Lew Adams, Treasurer; Buddy Wallace, Senior Warden; Ernie Stratton, Master; Dennis Stephens, Junior Deacon; John Dettor, Masonic Homes Ambassador, District 18; Rick Campbell, Tiler; Travis Bush, Senior Steward; Jim Herzog, Junior Steward; Ed Tanner, Secretary; Adam Gross, Senior Deacon. Last but not least, five Brothers from Latonia No. 746 attended our annual installation of officers and took home to their Lodge the District 18 Traveling Gavel. The next opportunity to claim the Traveling Gavel will be at their Stated Communication on January 7, 2016. A fellowship meal will be served at 6:30 PM followed by their Stated Communication at 7:30 PM. 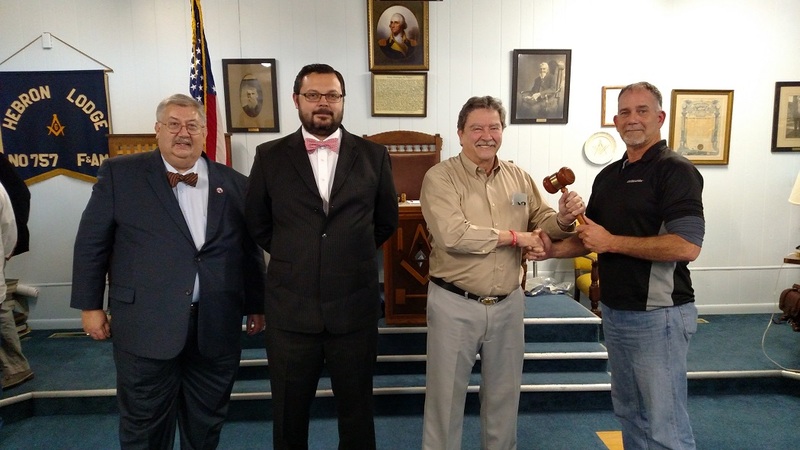 Pictured above, left to right: Brad Drew, Senior Warden; Ernie Stratton, Master of Elvin E. Helms No. 926, P.M.; Chuck Yocom, Junior Warden, P.M.; Tom Roundtree, P.M.; Vern Gregory, P.M.; Ira Brockman, Junior Deacon, P.M.
Worshipful Bro. 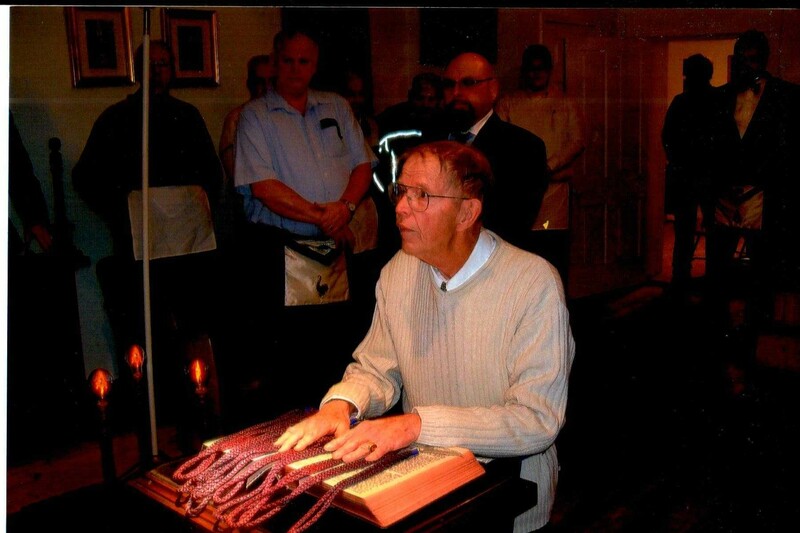 Ernie Stratton, P. M., takes the oath and obligation as Master of Elvin E. Helms Lodge No. 926. Installing Master John Dettor, P. M., and Installing Marshall Travis Bush, P. M., present newly installed Master Ernie Stratton, P. M., to the Craft. Installing Marshall John Dettor, P.M., presents Bro. Jason Wallace, P. M., and Bro. Buddy Wallace, P. M., for installation as Junior Warden and Senior Warden. Bro. Jason was Master of our Lodge in 2013 and Bro. Buddy currently serves as Master of Burlington Lodge No. 264, and previously served as Master of Burlington Lodge in 2012. Bro. Lew Adams, P.M. and Bro. Ed Tanner, P. M., will continue their outstanding service to our Lodge as Treasurer and Secretary, respectively, in 2016. Installing Marshall John Dettor, P.M., presents Bro. Dennis Stephens, P. M., and Bro. Adam Gross, P. M., for installation as Junior Deacon and Senior Deacon, respectively. Bro. 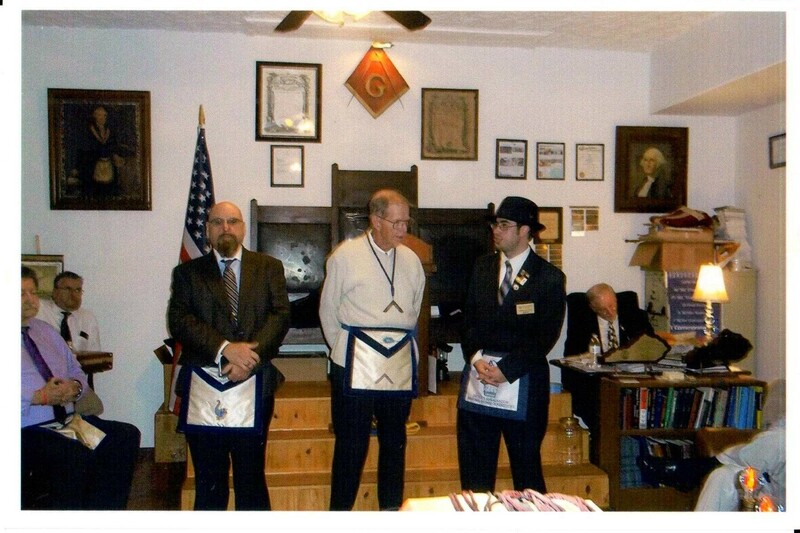 Dennis served as Master of our Lodge in 2005 and Bro. 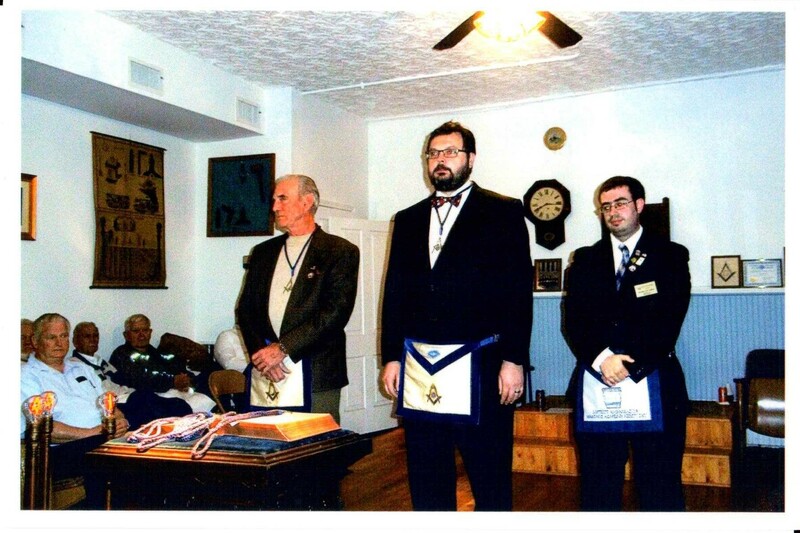 Adam served as Master of Newport Lodge No. 358 in 2015. Bro. Rick Campbell, P. M., Bro. Jim Herzog, P. M., Bro. Travis Bush, P. M. and Bro. Mel Kinser, P. M., stand ready to be installed as Tyler, Junior Steward, Senior Steward and Chaplain of our Lodge for 2016. Installing Marshall John Dettor present Bro. Mel Kinser, P. M., for installation as Chaplain of our Lodge. Bro. Mel served as Master of our Lodge in 2004, 2009 and 2010. Bro. Mel served as District Deputy in 2001-2002 and as Grand Chaplain of the Grand Lodge of Kentucky in 2006-2007. Worshipful District Deputy Grand Master, District 18, Dan Kemble and Brother Adam Gross, P.M., paid a visit to Florence No. 949. The Brothers of Florence No. 949 made the difficult but important decision to protect their financial future and sell their building and rent from Walton-Verona No. 719. All things considered, a great time was had by all. 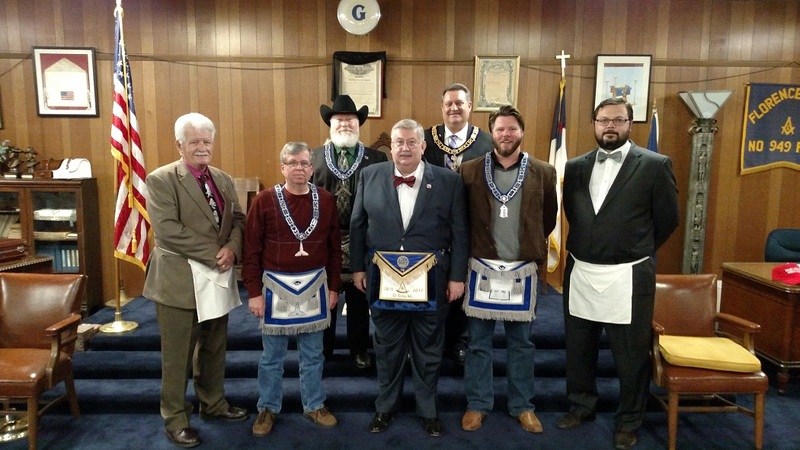 Pictured above, left to right: Jim McClure, Grand Lodge Committee on Archives; Perry Burnett, Senior Warden; Steven Teufel, Master; Dan Kemble, District Deputy Grand Master, District 18; Tim Sanders, Right Worshipful Grand Senior Warden; Anthony Crutcher, P.M.; Adam Gross, P.M.
Brothers Buddy Wallace, P.M.; Dan Kemble, District Deputy Grand Master, District 18, Grand Lodge of Kentucky; and Adam Gross, P.M. visited Hebron No. 757 to retrieve the District 18 Traveling Gavel and complete an in-District traveling requirement towards the 2016 Grand Master’s Lodge of Excellence Award. 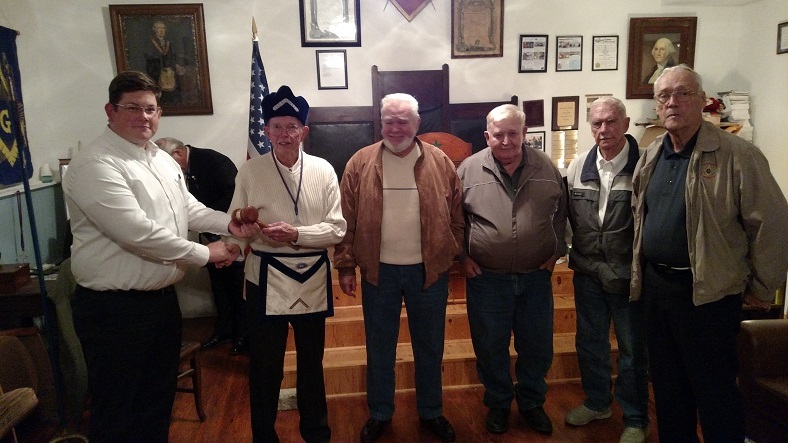 Pictured above, Worshipful Brother Tom Cooper presents the gavel to Brother Buddy Wallace who claimed it on behalf of Elvin E. Helms No. 926. We had a great visit with the Brothers of Hebron No. 757, as usual, and were also present to hear their officer nominations for the 2015-2016 year.